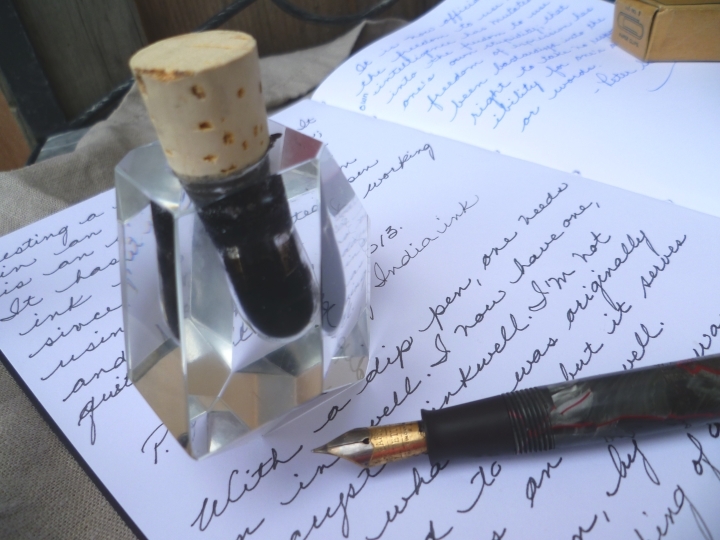 I have no intention of going on and on about my fountain pen obsession but I do have one pen story that I’d like to share with you. I have, in my possession, a vintage Schaeffer fountain pen, circa the 1930’s. While John and I were still living in Kamloops, we went for a drive one day. We noticed an old farm at the river’s edge; there was no driveway to the house but we could see that vehicles had gone through the field to it so we decided to check it out. The property was completely derelict. 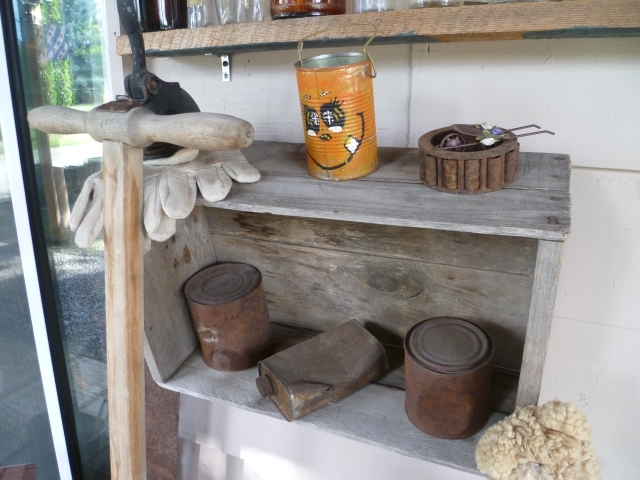 There was farm equipment left in the yard; the outbuildings were filled with old things. We explored the house; whoever had lived there had either died and no one had come to clean out the house, or he had simply left one day and never come back. We salvaged a few things from the house, including some old letters, books, military uniforms, a pair of men’s skates, and some little bits and bobs… even an old jar of Vaseline! Among the scattered debris, I found an old fountain pen. It had no cap (perhaps it was somewhere in the debris but we weren’t going to hunt for it) and the ink bladder had completely disintegrated but I found it interesting so I kept it. During the ensuing years, it lived in our little “museum”, a collection of little things that moved with us from Kamloops to Kelowna and to every house we’ve lived in. With my love of fountain pens renewed, I looked at that pen again, brought it inside and decided to clean it up and give it a better “home”. Then, today, while I was writing my Postcrossing cards, that pen came to mind again. I suddenly remembered that I had a bottle of India ink somewhere and that any fountain pen can be used as a dip pen. I went hunting. Where had I put the ink? I remember purchasing it at the Lewiscraft where I worked as a manager, in Kamloops, but that was more than ten years ago. I knew it wasn’t in the shed with some of my arts and craft supplies because ink is liquid and it could freeze but where in this house had I stored it? I did finally find it in a shoe box with a few other paints that I didn’t want stored in the shed. I gathered paper, pen, ink and a paper towel for safety’s sake and experimented. To my surprise and delight, it worked! The next thing I needed was an inkwell. 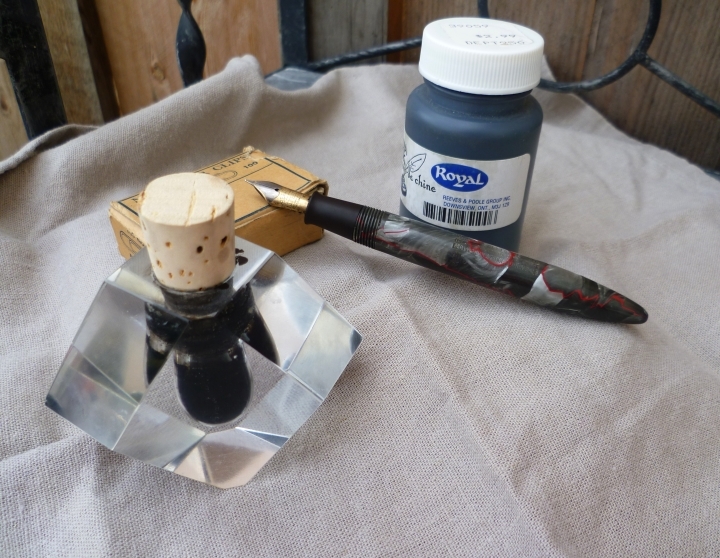 The bottle of India ink is a plastic one, fairly tall and narrow and definitely tippable and spillable. An inkwell would make the process of inking the pen so much easier as there’s just enough ink to dip the pen into and it would be much more stable, less chance of knocking over an entire bottle of permanent ink. While going through drawers and cabinets today, I came across a cut crystal bottle. I’d always thought it was a perfume bottle but after perusing inkwells on Google Images and on Pinterest, I became more and more convinced that it was, in actuality, an inkwell. All that was missing was a stopper. Enter the bottle of garlic oil a friend had given me as a hostess gift. To be honest, I don’t much care for the oil and it’s been sitting on my counter for the last few months. The cork in the bottle, though, is exactly the right size for the mouth of my new inkwell. I am now good to go! I have to say, I’m thrilled to be able to use this pen. It has made me want to write more. As I write with this pen, I’m constantly wondering who it belonged to, what was that person like, where did the pen come from, what experiences did its owner write about, so many questions. What do I know? I know that at some point, the owner of the house had seen combat. We found, and salvaged, two air force uniforms. From some of the letters we read there, we discovered that the owner of the property had been committed to Riverview, a psychiatric hospital near Vancouver. We assumed, from some of the letters and from some of the furnishings left behind that he was British born and possibly a younger son of a wealthy family. The pen, incidentally, is a Schaeffer Lifetime Balance pen, almost identical to this one, from the 1930’s. I’ve seen them for sale online for about $200 US, refurbished. I thought about having mine refurbished but I’m not sure I want to. I like the thought of using it as a dip pen; I like the thought of using this pen as it is. Believe it or not, this pen has now become my favourite pen, simply because I know that someone else had it first, used it, and lost it… I may not know the circumstances behind why this man left everything but from some of the things we saw in his home, I know that he appreciated fine things. So do I.
I will freely admit to it – I sometimes become obsessed with things. Pens, for instance. I love pens. A good pen is a precious thing. The good pens are to be guarded and used by no one else but me. Even at work, heaven help the person who “borrows” my good pens and, yes, even pencils (mechanical pencils only, thank you… preferably Staedtler mechanical pencils). Hand in hand with a pen obsession, I love paper, too. Beautiful notebooks, cards, paper… it’s all good! I’ve long been a crafter and I’ve long worked with paper. This past week, I played with paper again. See, I said I was obsessed with pens. That aside, though, do you see the notebook? I made it. 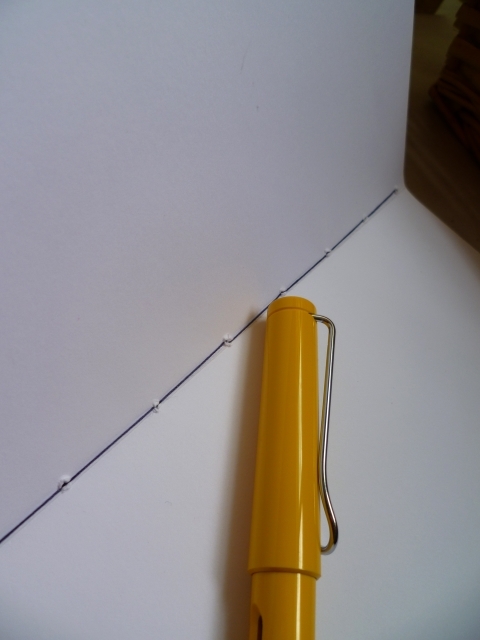 I came across a pin on Pinterest about basic bookbinding. It lead to this series of tutorials on the website Damask Love, entitled Bookbinding University. 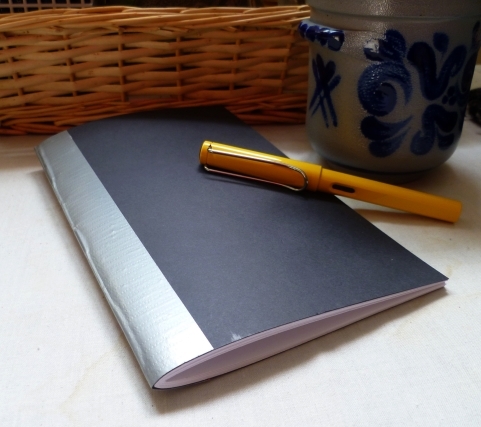 Lesson one shows how to make your own composition notebook. It really was quite simple; it helps that I had most of the supplies to make a notebook, as well as ready access to paper. The pages and cover are pierced and hand-stitched together. The plan is that this will be my fountain pen practice notebook. Even though my handwriting is quite presentable, I’d like to improve it. John chuckled a bit when he saw that I’d used duct tape for the binding. The tutorial calls for book cloth; that, however, is one thing I do not have. I do have duct tape and it has a fiber mesh, so I considered it the next best thing. 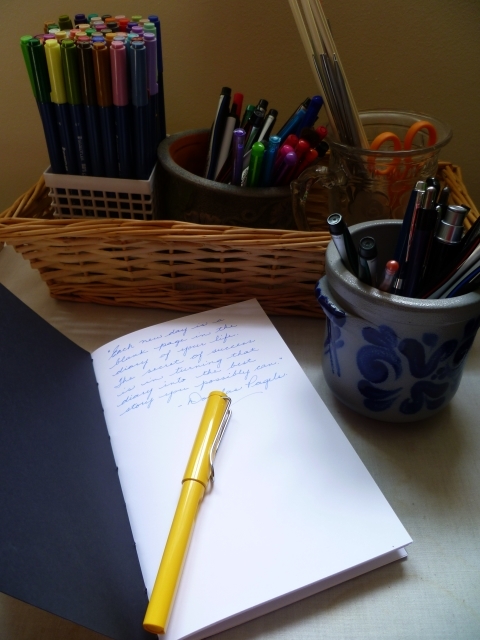 The yellow pen, by the way, is my Lamy Safari fountain pen, my new favourite writing implement. The quote on the first page of the book, incidentally, is by Douglas Pagels.